This mail order pattern came in its original Alice Brooks envelope. There is no copyright date on the pattern, or postmark date on the envelope, but the zip code used in the address indicates it was mailed sometime after zip codes were introduced in the mid-sixties. This is a transfer pattern; unfortunately the ink from the transfer has bled through to other sections where the pattern was folded. 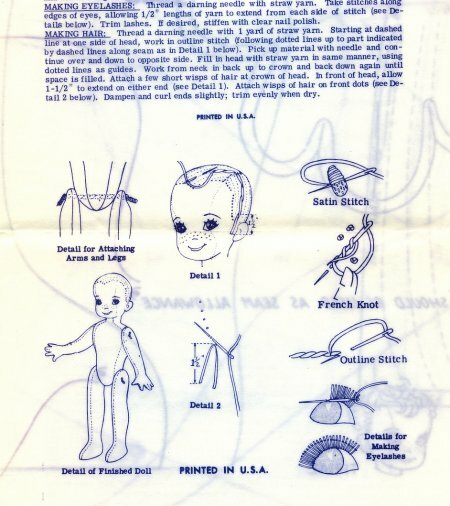 The pattern makes a baseball-head style boy doll, 32" tall, with embroidered features and "straw yarn" for hair and eyelashes. Because of the large size of the doll, two entire sheets are required for all of his body parts to fit. 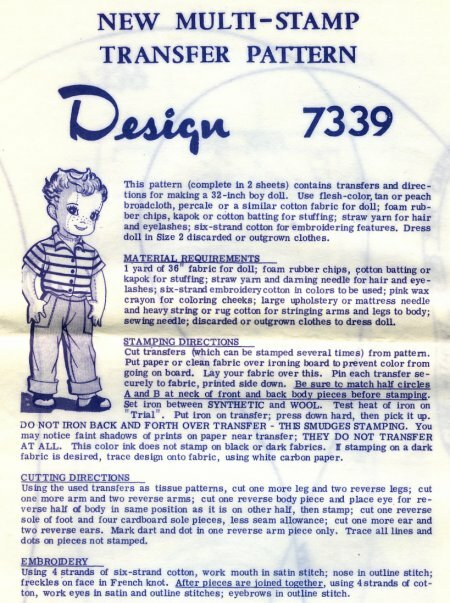 No clothing pattern is provided; instructions call for "discarded or outgrown" size 2 clothes for him to wear. He is a cute boy with freckles and applied ears. His hands have separated fingers with the exception of the third and fourth fingers which are joined together. The eyelashes are another unusual touch. The maker is instructed to stiffen them with clear nail polish, if desired. Depending on the stuffing used, this doll may be very heavy. A large upholstery or mattress needle is recommended, with heavy string or rug cotton, to join his arms and legs to his body. There are many patterns to make both a boy and girl doll, but very few that make just a boy by himself. Of course, a pattern for a girl in this size was also available.